Fiona Foley, The Oyster Fishermen #11, 2011 Inkjet print on Hahnemuhle paper 85x103cm (framed), Courtesy of the artist, Andrew Baker Art Dealer, Brisbane, and Niagara Galleries, Melbourne. Saltwater Country is a major travelling exhibition which has had a successful run overseas, and is to visit a total of ten public Australian galleries before it ends in 2017. It showcases 16 of Queensland’s most critically acclaimed Indigenous artists, including Vernon Ah Kee, Michael Cook, Daniel Boyd, Fiona Foley, Rosella Namok, Mavis Ngallametta, Laurie Nilsen, Napolean Oui, Brian Robinson, Ken Thaiday, Alick Tipoti, Ian Waldron, Judy Watson, and new talents Megan Cope, Ryan Presley and Erub Arts. Curated by Michael Aird and Virginia Rigney, Saltwater Country offers audiences a unique insight into the historical, environmental and personal concerns of the artists and their strong cultural connections to ‘their’ saltwater country – Queensland’s coastline, sea and waterways. Says Virginia Rigney, "The saltwater country is a place of bounty and these places facilitate movement and contact, with tidal and seasonal flows structuring the rhythms of the day and the year, with dramatic times of flood and storm bringing renewal and change. The coastal edge is also currently charged with concerns over environmental change, pollution and human impact. In making artworks about these issues artists are redefining the practice of caring for this meeting point between land and sea…"
Don't miss this - Saltwater Country will only be at Tandanya until 6 June 2016 so be quick. Trevor 'Turbo' Brown seems to a man of many talents since his name is known in painting, boxing and rapping circles. His first solo exhibition at the Koorie Heritage Trust in Melbourne in 2004 was a sell-out, and almost all of the pieces sold on opening night. Turbo's intense and vibrant works of animals and birds is reflective of the life he lived as a teen - when he lived on the streets of Mildura and animals were his only friends. His work reached the finals at the 22nd National Aboriginal and Torres Strait Islander Art Awards in 2005, 2006, and 2008. 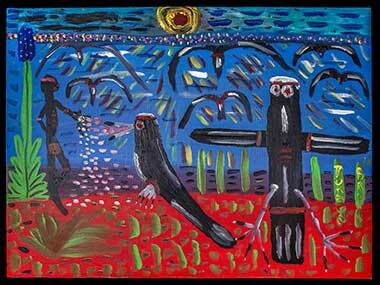 And in 2012, he won the Deadly Art Award - Victoria's highest honour for an Indigenous artist, for Owl Dreaming. What began in 1995 as a series of basket–making workshops by NPY Women’s Council in the Ngaanyatjarra Lands of Western Australia, has developed into an exhibition of vibrant fibre work thanks to the backing of the Art Museum of Western Australia. 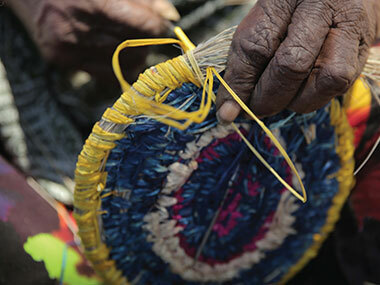 Building on a long history of using natural fibres to make objects for ceremonial and daily use, senior Ngaanyatjarra women took up coiled basketry quickly, and were soon sharing their newfound skills with relatives and friends from neighbouring communities. Today over 400 women across three states make this spectacular contemporary fibre art - and even experiment with sculptural forms - all made from locally collected grass. Trevor Nickolls, known as 'the father of urban Aboriginal Art', was the first posthumous winner of the Blake Prize. One Sydney Morning Herald journalist, Nick Galvin, ventured to write about the circumstances around that win reporting it as "eerie". This promises to be a fascinating talk about Nickolls' work and, according to the invite, "includes the painting of the State Bank collapse". The speakers are Professor John Spoehr, Director at the Australian Industrial Transformation Institute, Flinders University and Nic Brown, Collections Manager, Flinders University Art Museum. Turbo Brown, Kurdaitcha Man feeding his magpie mates, 91x122cm, 2015 (Photographer: Chris Geracitano). Pampa Mara Tjanpi – Senior Elders Weaving (Photographer: Johanna Standish-Hansen).